GEORGIE WEEDON is an award-winning filmmaker, photographer, author and broadcaster. Her films have been screened internationally at festivals and broadcast to over 100million viewers on Al Jazeera, at BAFTA (top talent showcase), and the Frontline Club, London. She was on the launch team of Al Jazeera where she and a team developed Witness, the daily documentary programme, she co-authored a book about her time traveling around the Middle East: Four Young Artists in The Middle East(Booth Clibborn Editions) and was selected by Cambridge University as a Climate Leadership Fellow. Her photographs have been published in the Observer, on BBC online, on Ministry of Counterculture and in the book she co-authored Four Young Artists in the Middle East published by Booth Clibborn Editions. In 2015 she spent a year documenting the revolutionary underground theatre company Belarus Free Theatre creating a series of short films for the BBC and contributing to the book On Freedom, an anthology of short essays on the concept of freedom. Her photos from the series Photographing a Revolution can be seen here. Founded Gingerwink Media with a focus on Climate Change, clients included UN IPCC, Prince of Wales Corporate Leaders Groups on Climate Change, Ben and Jerrys. 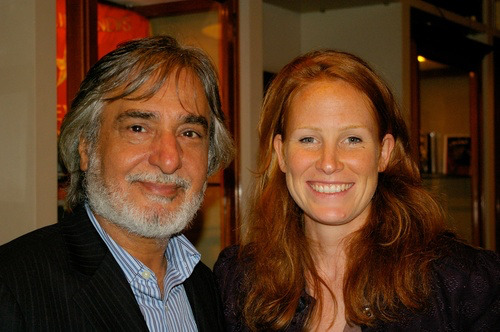 Georgie was the third member of the launch team of Al Jazeera English and was responsible for the global channel's documentary acquisitions and commissions; developing and naming the daily documentary show, Witness. She produced and directed Return to Somalia with Rageh Omaar for Al Jazeera, Writer’s Guide to Cairo with Hugh Miles, and also produced Kosovo’s Cadets about the independence of Kosovo. "For all of us the words Middle East conjure images, like anyone else, we'd read about it in newspapers, seen it on the telly and the pictures we saw were all terrorism, desert, oil and fear. And we had distant, hard-to-place images of Ali Baba, flying carpets and funny-looking water pipes being smoked by men wearing red-felt hats. We were distant and that was the premise. We had to get closer, to see what happened when the broadcast finished, to get ourselves Offscreen. "A fresh, youthful take on the Middle East" – Geographical, "Nothing short of inspirational" - The Middle East in London, “Picture Book of the Week” - The Independent, “Picture of the week” - The Times. - Script Factory, "one of Europe's most talented emerging filmmakers"
The Belarus Free Theatre celebrated its 10th anniversary in November 2015 with the Staging a Revolution festival, featuring 10 landmark productions. Meet some of the members of the company in a series of films or BBC Arts. Nahil Mohana is a playwright from Palestine. In summer 2014 and again in 2015 she was invited to work on her play "Lipstick" by the Royal Court in London. The UK Border Agency refused her entry to Britain both times. In response, the Royal Court and Nahil began exchanging film across the borders. This is what they produced. We follow UK’s Big Brother winner Sam Evans as he travels from the UK to Malawi to see the work of hearing loss charity Sound Seekers. In 1979, Nabeel Yasin fled his homeland with his wife Nada and three-year-old son because he had published poetry that did not conform to the views of Saddam Hussein and his regime, including the work The Poet Satirizes the King. Branded an 'enemy of the state', Yasin faced imprisonment and likely death if he remained in Iraq. He continued to write and publish poetry from exile in the UK, his works smuggled back into Iraq where they became a popular symbol of resistance. A fictional story about Maya, a Young Iraqi girl who works in the kitchen of her father’s Arabic restaurant on London’s Edgware Road. When she applies to a fashion school to pursue her ambition to become a designer, Maya is forced to decide which comes first: her dreams or her family. Selected and won many festivals including BFI London, screened at BAFTA as part of an emerging talent showcase. In 2008, Russia warned that Kosovan independence would damage security across Europe. To help maintain stability during the transition, a security force was established under the auspices of the United Nations. We meet Arbresha Rrhamani, Pristina’s first female cadet at the new military academy, and discover her hopes and dreams for Kosovo’s future. Witness presenter Rageh Omaar (Al-Jazeera English) travels back to Somalia , his birthplace, where he encounters a people living through drought and gains an insight into the growing influence of Islam in the country. After 16 years of chaos there was cautious optimism when the Islamic courts chased the CIA-backed warlords out of Mogadishu. But two months later Ethiopia and the Islamic Courts Union that now control most of southern Somalia are on the brink of war. Is a new humanitarian crisis looming in the embattled region? Iraqi poet and academic Dr Nabeel Yaasin and filmmaker Georgie Weedon at the Frontline Club ahead of The Poet of Baghdad screening.